Alas, in the end I never found comprehensive, annual labour time data, so I settled with something less rigorous but hopefully capable of making the point. The data I was able to bring together I used to create the chart below showing change in GDP per capita versus change in hours worked per year per employed person, with the latter acting as my way of calculating Marxian SNLT. You can now have a look-see for any strong, lasting corelations between the two. I chose per capita figures to remove any noise from the GDP growth figures, by which I mean GDP growth from population growth. In a discussion about something that is compiled in such a way as to offer a per capita dataset anyway, as labour time records are, you might as well skip aggregate GDP and go straight to the per capita stuff. I extrapolated change data from the static data in the sources because the static data are not in comparable/commensurable units, whereas the change data are both percentages, making the comparison more meaningful. My GDP data are from Angus Maddison. My labour time data are from EH and Our World in Data. All measures of change in these two things are by Yours Truly. No doubt you can see that sometimes there appears to be a positive correlation, and sometimes a negative, but that there is no fixed ratio of change in one factor versus the other. Overall there is, as I would expect, no correlation. 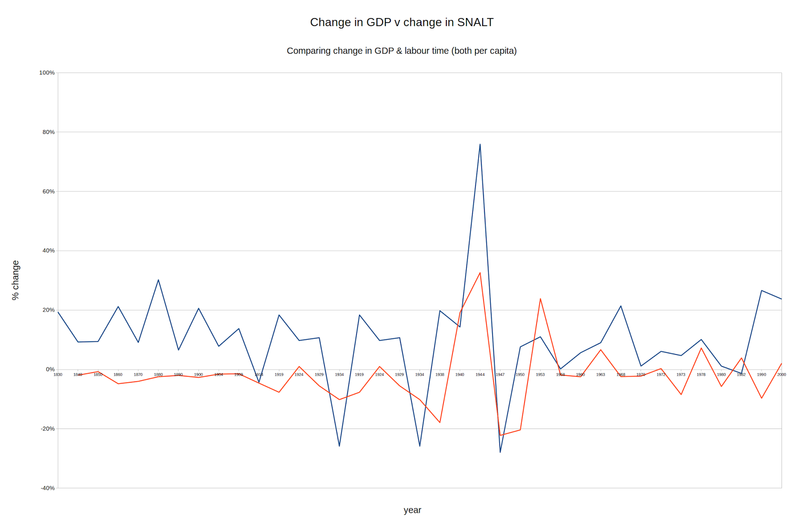 Since economic growth due to population growth has been abstracted away by making the GDP data per capita, why is there no neat relationship, whether linear or exponential, between change in GDP and hange in labour time? A Marxist might answer "because the kind of changes in technology and capital allocation that increase productivity are heterogeneous" but does this response not render the theory of SNLT untestable? If SNLT is a macroeconomic abstraction then it stands or falls under the kind of macroeconomic lens applied in the graph above. Under my lens, it falls. And that's that. Marx was wrong. Marxians are wrong. The intervals are not uniform, but they are shared across both factors, with the latter fact makes the former redundant. All of the data points used are below. I got them onto this blog post quickly using something called Tableizer. Once I've done my preliminary analysis of the data I have produced I will stick the spreadsheet file up on this blog, including appending it to this post. EDIT 21st January 2017: I got into a Reddit argument about the Marxian LoV, and it was a response from the other party that motivated me to do the study above.